Alma Moonin asked me to put together some information on Sts. Sergius and Herman of Valaam as well as the Nanwalek Russian Orthodox Church named after the two Saints. The feast day of the Church is celebrated on July 11th. In this post, I explore some of the history of the Sts. Sergius and Herman of Valaam Church. Sts. 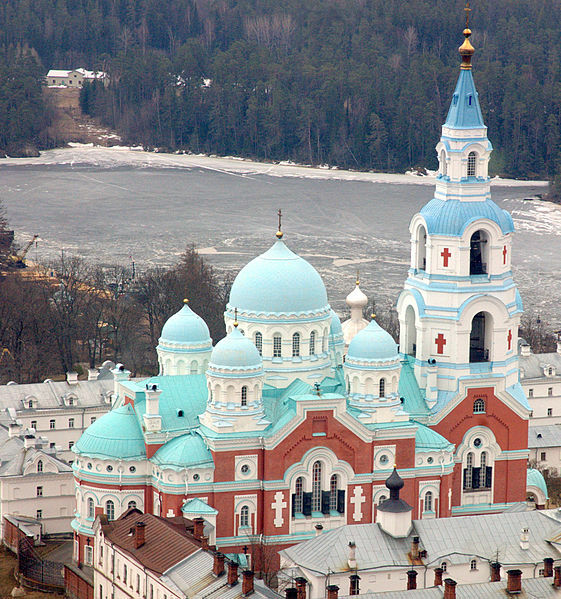 Sergius and Herman of Valaam, Enlighteners of Karelia, are the founding fathers of the Valaam Monastery that is located on Lake Ladoga. St. Sergius, originally a Greek monk, was tasked with establishing Orthodoxy in Karelia. The exact dates of St. Sergius’s activities in Valaam are not known, but often placed somewhere between the late 900s and early 1300s. Even less information is available on St. Herman of Valaam, who was probably Karelian in origin. It is also questioned whether St. Herman was a contemporary of St. Sergius. Nevertheless, the two Saints together are credited with the establishment of the Transfiguration Monastery on Valaam Island that is currently under Russian authority. Sts Sergius and Herman of Valaam Icon. Orthodox Church Museum, Kuopio, Finland. Wikimedia commons. Wikimedia Commons – Князь-Владимирский храм на Валааме, by Иерей Максим Массалитин. Wikimedia Commons – Спасо-Преображенский собор Валаамского монастыря (1896) by by Иерей Максим Массалитин. Despite the geographical distance between Karelia and Alaska, as well as the over 500 years in difference, Sts. Sergius and Herman of Valaam were highly regarded and often remembered in Russian America. This was due to the fact that the first Russian Orthodox clergy came to Alaska from the Valaam Monastery. Upon request by Shelikov and Golikov, Empress Catharine II (the Great) and Metropolitan Gavriil selected ten men from the Valaam Monastery. The mission was headed by Archimandrite Ioasaf, and included priests Afanasii, Makarii, and Iuvenalii, hierodeacon Nektari, and lay monk Herman, among others (Black, Lydia 2004 Russians in Alaska 1732-1867, p. 231.). It is important to recognize that the name “New Valaam” may refer to either a location in Finland or Alaska. 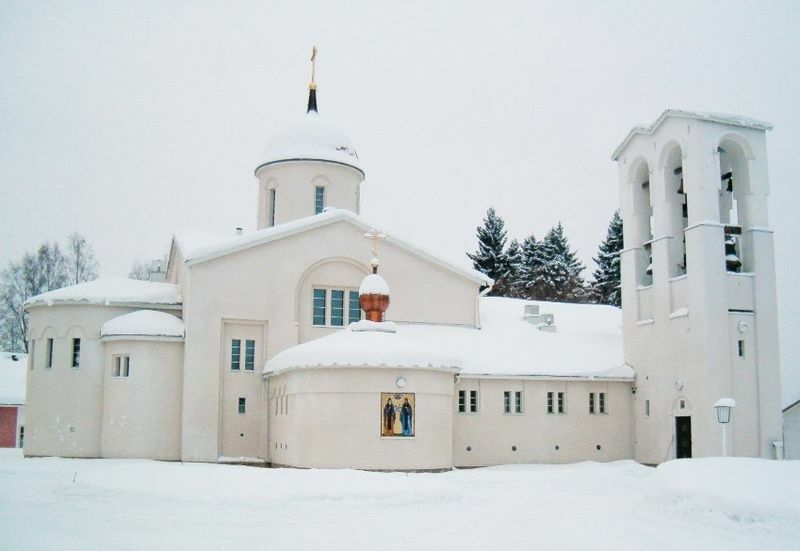 During the Second World War, the monks of Valaam Monastery were evacuated from Lake Ladoga to Heinävesi in Finland, where they settled and established a new Monastery. New Valamo is under the jurisdiction of the Finnish Orthodox Church. New Valamo Monastery Main Church – Wiki commons by Pertsaboy. 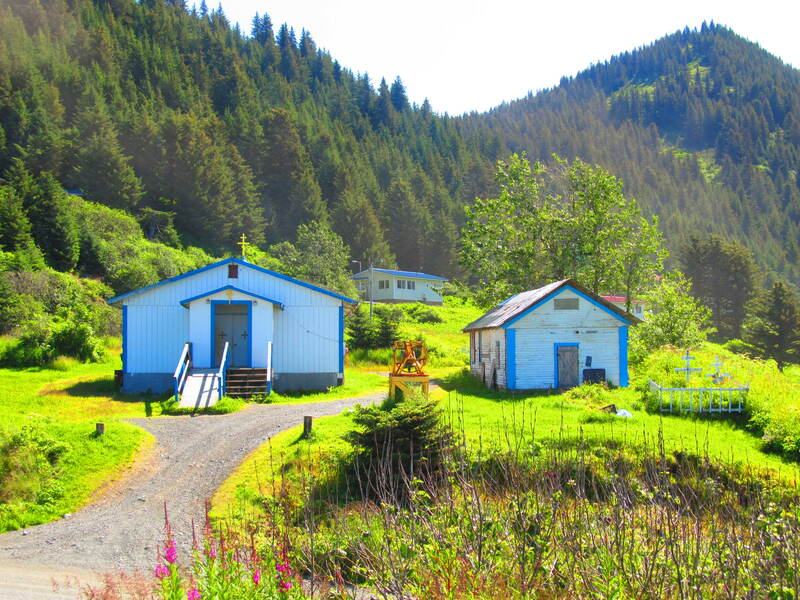 In Alaska, Spruce Island gained the name “New Valaam,” after St Herman’s, the above mentioned lay monk’s, hermitage who came to Russian America as part of the Valaam mission. St. Herman, perhaps Alaska’s most beloved Saint, lived on the Island as a hermit, and his feast day is commemorated by the annual pilgrimage. One of the original members of the Valaam mission, Fr. Iuvenalii, who was on his way from Nuchek to Iliamna, where he was later martyred, is believed to have visited the lower Kenai Peninsula area, and quite possibly even the Aleksandrovskoe settlement that is today’s Nanwalek. Fort Aleksandrovsk was established in 1786 and was left in the care of one Vasilii Ivanovich Malakhov, an employee of the Shelikov Company and originally a citizen of Velikii-Ustiug of Russia (Pierce, Richard, 1990, Russian America: A Biographical Dictionary, pp. 338-339). As Fr. Iuvenalii was trained in chemistry, he might have decided to inspect the coal deposits on the Peninsula (Sister Victoria, 1974, The Russian Experience. In The Native, Russian and American Experiences of the Kenai Area of Alaska. p. 51). These coal deposits, across the bay from Nanwalek in Coalmine, were originally noted by Captain Portlock during his voyage in 1786. 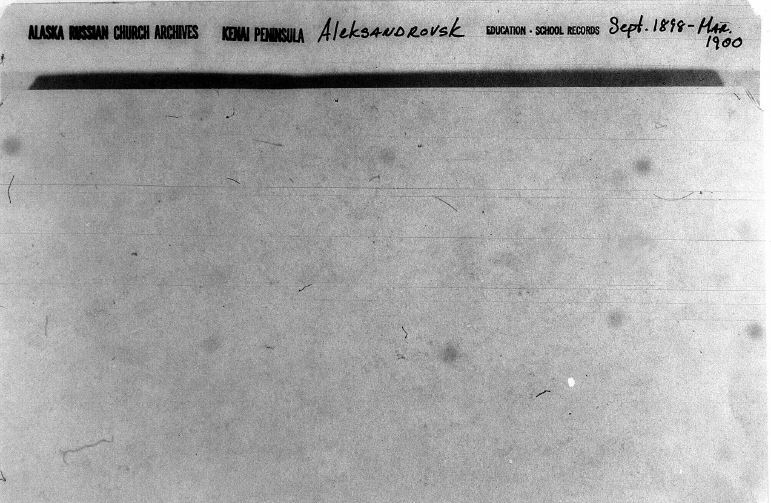 My research with the microfilm copies of the Russian Orthodox Greek Catholic Church of America, Diocese of Alaska Records suggest that Coalmine, or by its Russian name, Gornaia Ekspeditsiia (Горная Експедиция), was the location of the first Russian Orthodox Church in the region. This church was the Sts. Sergius and Herman Chapel. Reel 182, Russian Orthodox Greek Catholic Church of America, Diocese of Alaska, Records, Manuscript Division, Library of Congress, Washington, D.C.
Reel 202, Russian Orthodox Greek Catholic Church of America, Diocese of Alaska, Records, Manuscript Division, Library of Congress, Washington, D.C.
By the 1850’s, Gornaia Ekspeditsiia (Горная Експедиция), as the settlement of Coal Mine was called in Russian documents, was outfitted for production, and serviced by approximately 80 people (Pierce, Richard, 1975, Russian Coal Mine on the Kenai. Alaska Journal 5(2):104-108. P. 107). The reason for developing the mine was governed by the Russian American Company’s (RAC) desire to offset the company’s losses from the declining fur trade. The newly discovered gold in California and the increased demand for coal seemed like a good investment opportunity (Dmytryshyn, Basil, 1989, The Russian American Colonies 1798-1867. To Siberia and Russian America, Three Centuries of Russian Eastward Expansion, pp. 510-511), and Peter Doroshin, a mining engineer sent out by the RAC in 1853, reported favorable prospects on the coal deposits near Port Graham (Pierce 1975: 104). In 1855, Enoch Furuhjelm, a Finnish mining engineer in the service of the RAC, was dispatched to the current location of Coal Mine along with a 45 member crew of various origins (Furuhjelm in Pierce 1975: 196). Furuhjelm spent eight years at Coal Mine, creating not only a mining industry but also a settlement, in fact the third largest settlement of Russian America (Furuhjelm in Pierce 1975: 107), which received 409 workers brought over from Russia between 1857 and 1863 (Fedorova, Svetlana, 1975, Ethnic Processes in Russian America, p. 8). “… the village contained a church, 20 various-sized dwellings, a large warehouse, two stables, an engine lathe, a sawmill, a blacksmith’s shop, the mine superstructure, a kitchen, a small foundry, and some sheds; the production of coal amounted to 5,000 tons, and the expedition had eleven head of cattle and two horses” (Furuhjelm in Pierce 1975: 107). Although the Company invested considerable resources in Coal Village and the mine, the business was not profitable. The expenses of mining and delivering a lower grade coal to California outweighed the profit that could be earned; therefore the village was officially closed down in 1865. Coal Mine, for the Sugpiaq of the region, did not completely cease to exist. Some of the buildings and properties were transferred to Aleksandrovskoe, including the church bell, and presumably other religious items as well, such as icons, crosses, service items, prayer and service books. Although the first Orthodox Church of the Lower Kenai Peninsula was the one erected in Coal Mine, and its existence was cut short by the changing RAC policies, it lived on in the neighboring settlement of Aleksandrovskoe. The local oral history dates the erection of the first church in Nanwalek to the 1860’s, but the exact location of this Church is unclear. Nanwalek Elder Natalie Kvasnikoff shared that she was told about the location of the church having been near the lagoon, in the area currently occupied by the store and the school. The first church of Nanwalek is believed to have burnt down in the 1890’s. The structure of the wooden chapel was constructed diligently by the local people in 1872. In 1896 the chapel was encouraged to put up a cross and acquire a gospel. In 1897 the chapel got two large silver plated candlesticks. In 1898 the building was newly renovated the interior and exterior walls were trimmed [….] and repainted with oil paints of white color. The cupola was given a new tiling, the half of the floor was redone, and the other half was [……,], the ceiling similarly repainted with oil paints of light blue colors. The iconostas was separately renovated and they added on a new church porch. Around the structure of the church a fence was added/enclosed… The service items were sufficient” (translation by Alexandra Antohin). During the 19th century, and for the most part of the 20th century, Nanwalek and the surrounding settlements were serviced by priests based out of Kenai. These priests included Hegumen Nikolai Militov, Hieromonk Nikita Marchenkov, Priest Nikolai Mitropol’skii, Priest Aleksandr Iaroshevich, Priest Ioann Bortnovskii, and Priest Pavel Shadura (Znamesnki, Andrei, 2003, Through Orthodox Eyes). The latter, Fr. Shadura is still remembered by some of the Elders as one of their priests. The life of these priests and monks involved lengthy travels in harsh weather conditions, in order to fulfill the minimal yearly visits to all their parishes, and in many occasions, they failed to make it to all the villages. According to Port Graham Elder John Moonin, this was one of the reasons priests encouraged their parishioners to move closer to settlements where there was a church in place already, so that they could administer the sacraments to all their adherents. This practice led to further consolidations both in population and in church property in the region, and many locals moved from the outer Kenai coast closer to Fort Aleksandrovsk and Coal Mine. Peter Macha, a Sugpiaq man from Yalik, a currently uninhabited settlement located on the Outer Coast, moved to Aleksandrovsk for this very reason in the 1860’s, and took on a job at the coal mine across the bay, where he worked “for very poor wages, under extremely hard working conditions” (English Bay Students 1980, Alexandrovsk: English Bay in its Traditional Way, p. 18). Later, he married a local Creole girl by the name of Kathleen Romanov, and they became the parents to Marfa Macha, who was married to the first Orthodox priest born in the region, Nicholas Moonin. Priests, deacons, and readers were not only spiritual fathers but also fulfilled other obligations in Alaska Native villages. They were responsible making yearly reports of the settlements, churches, vital statistics of the parishioners, as well as organizing and teaching children. Below are photos pertaining to the first school of Nanwalek. The, then young, reader, Nicholas Moonin, planned to teach God’s Law, Russian, Arithmetic, and English in the school. The third picture shows some of the students enrolled in the classes who were Irina Macha, Agripina Malchova, Pavel Tanapi, the above mentioned Marfa Macha, Cibor Tubugin, and Grigori Anagunak. While the original church building burnt down, it was described by Priest Nikolai Mitropol’skii, visiting from Kenai in 1888, as “well-maintained” and one that “even has an icon-screen.” He also noted “the Creole[…] Ivan Munin” as the reader (Znamesnki, Andrei, 2003, Through Orthodox Eyes, p. 131). Currently, there are two church buildings standing in Nanwalek. The older one is on the National Register of Historic Places Inventory List and was described in the following manner on the nomination form. Indeed, local people often cite the purchase of the old Alaska Commercial Company store in English Bay for the purposes of turning into the Church. In fact, it was bought for two sea otter pelts, which were fetching high prices in the early 1900 due to the rapid decline of the animal caused by overharvesting. Nanwalek Elder Kathy Brewster explained that a man by the name of Meganack donated the pelts for the purchase of the building. Looking through the ACC archival records pertaining to Nanwalek, I located a short correspondence between J.A. Herbert and A.C. 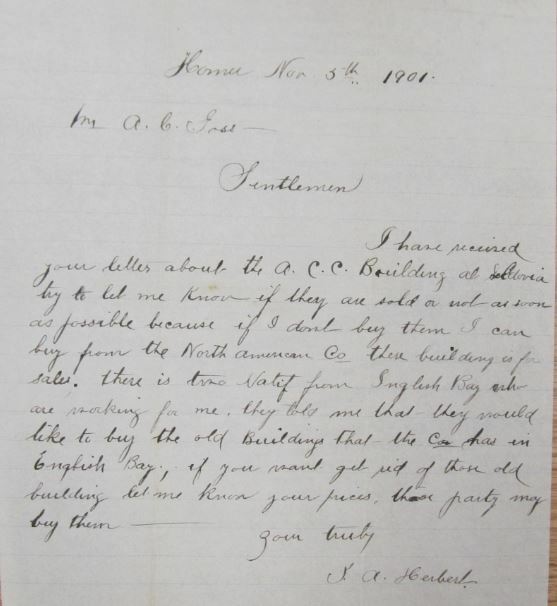 Gross discussing the possible sell of the building to “two Natif [sic] from Inglish [sic] Bay” who were working for Herbert. In the past, many Elders have shared their knowledge on the more recent history of the Sts. 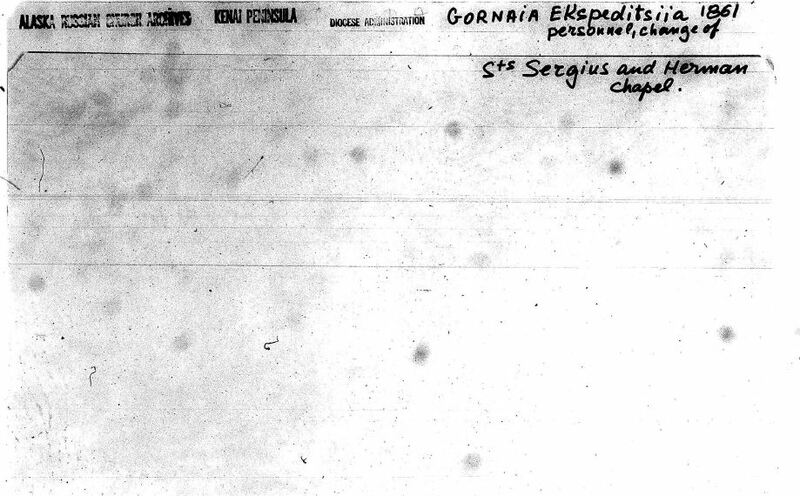 Sergius and Herman Church, but for the purposes of this post, I focused on the history as reflected in archival material and previous studies. The most recent history is best heard directly form Elders, who are always generous with sharing their knowledge and teaching the younger generations. Wishing the Sts. Sergius and Herman parish of Nanwalek a happy celebration! Sts. Sergius and Herman of Valaam Church, Nanwalek. During the past years, I worked on different projects in collaboration with community members in Nanwalek as well as with the Nanwalek IRA Council. One type of research I did for collecting information on the history of the lower Kenai Peninsula region is looking at archives and archival sources. I visited some of the archives in person and I also reviewed material and finding aids online. Whenever I found something relevant such as photos, recordings, documents, microfilms, publications, etc that pertained to the history of Nanwalek, the surrounding area, community members and their ancestors, I requested permission and placed additional copies into the Nanwalek Library and the Museum for everyone for use. These collections are available for checkout and anybody from the community can look at them and use them. Through various projects, that were generously funded by the National Science Foundation and the Alaska Humanities Forum, I also digitized all of the old audio tapes that were deteriorating. Now the digital versions are available for people to check out from the library, listen to them in MP3 formats, and download them to their computers. Most recently, first Wally Kvasnikoff and then Emilie Swenning, started to transcribe and translate some of these digitized stories, and as part of our collaboration, we also completed a small pilot-program to digitize old newspaper clippings, photos, and documents in the collection of the Nanwalek Museum. As many of you have expressed interest in reviewing and working with these sources, I believe a list of the sources I deposited at the Nanwalek Library would be helpful. I also deposited copies of all publication I so far produced from data collected and documented as part of this collaboration, so I listed those as well. Please keep in mind: All documents are included with permission from the holding institution or available to the public – they cannot be reproduced for profit. In general, documents can be used for personal research and educations purposes, but please contact the holding institution to ascertain reproduction and use limitations. This collection is intended for reference purposes – please see the digital files for additional details and/or documents. A Collection of Documents Pertaining to the Sugpiaq Ethnohistory of the Lower Kenai Peninsula of Alaska – These are organized into three ring binders with archival folders and placed in a black banker type archival box. 1996 Exxon Valdez Oil Spill Restoration Project Final Report. Anchorage: Chugach Development Corporation. Nanwalek, Port Graham – Part I pp. 27-30. – Kenai Peninsula Borough AK Archives Cemetery – Saints Sergius and Herman of Valaam Russian Orthodox Cemetery in Nanwalek, Alaska. The Kenai Totem Tracers Genealogy Society. Fall, James A. 2006 Update of the Status of Subsistence Uses in Exxon Valdez Oil Spill Area Communities, 2003. Techincal Paper No.312 – Alaska Department of Fish and Game. Stanek, Ronald. Chapter V: Nanwalek Pp. 83-107. Creator: Russian Orthodox Greek Catholic Church of America. Diocese of Alaska Extent: 87,000 items; 748 containers plus 23 oversize; 326 linear feet; 402 microfilm reels. – English Bay. Inventories. Sts. Sergius and Herman Church, 1880. Michael Z. Vinokouroff papers, 1764-1984. 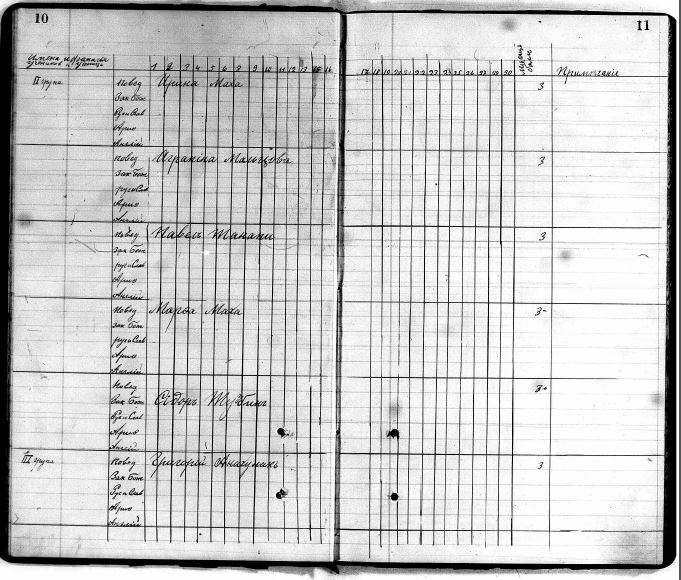 Parish records (1810-1915 and n.d.). Alphabetical by parish. Folder 44. Kenai Mission. Accounts. 1860-1867. Eight documents: expenditures, income, disbursements, and receipts. Folder 45. Kenai Mission. 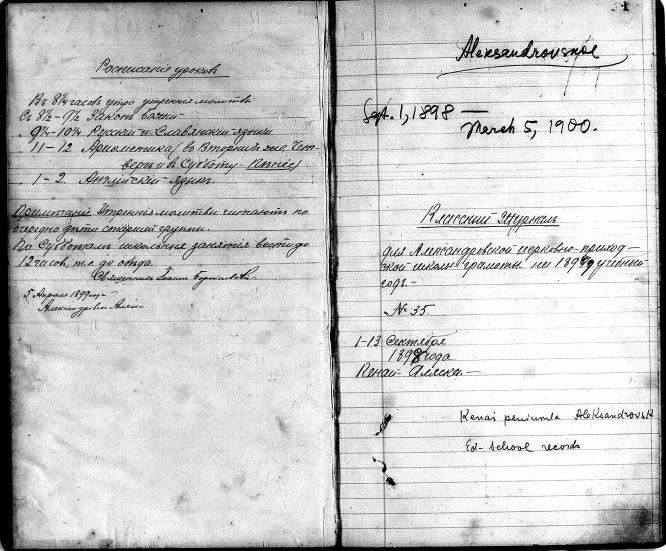 Hegumen Nikolai (2 documents). 1867. Certified copy of last will and testament, 13 Feb. 1867. Report serving as cover letter for testament and for writings (Box 23, Folder 20). Folder 46. Kenai Mission. 16 documents. 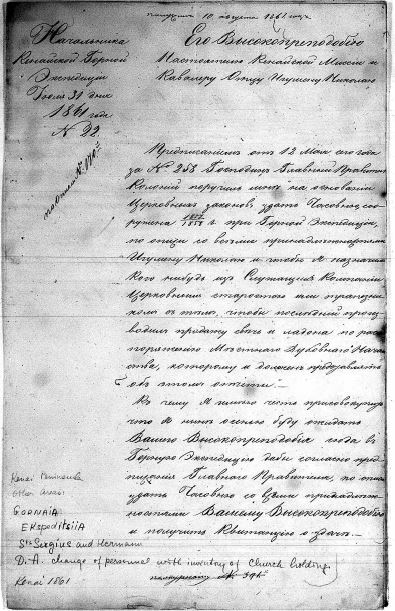 1849-1867 and n.d. Includes reports and letters from Hieromonk Nikolai to Bishop Innokentii and others. Report by subdeacon Makarii Ivanov of the Kenai Mission, 10 August 1867, on the last illness and death of Hegumen Nikolai. Folder 9. Russian Orthodox Church. Alaska Bishopric. Clergy Service Records. Kenai Church of the Dormition of the All-Holy Theotokos 1907. Folder 46. Reader Ivan I. Kvasnikov (Kenai, AK) to Hegumen Victor. 22 Dec. 1914. Folder 47. Ivan Efimovich Munin to an unnamed ecclesiastical superior. 1892. Describes founding of Chapel of St. Sergius and St. Herman following Russian withdrawal of 1867. Box 24 Clergy correspondence, 1922-1980s. Letters received (Folders 1-44). Shadura, Pavel A. Kenai, AK 1940-1941 3 letters. Alaska Commercial Company Records. Box 8, Folder 91, 92, 93, 96, 98, 99, 100, 101, 102, 104. Archives, Alaska and Polar Regions Collections, Rasmuson Library, University of Alaska Fairbanks. Alaska Commercial Company Records. Box 9, Folder 105, Archives, Alaska and Polar Regions Collections, Rasmuson Library, University of Alaska Fairbanks. BIA Census, National Archives – at the time of collection, these documents were in the Anchorage repository, which is now disbanded. These documents are in spiral binding. Digitized Tapes. Alexandrovsk interviews 1980-1981 – The original audio tapes are in the care of the Nanwalek Library. The digital files are available in a booklet that is in a three ring binder. I attached a Flash Drive with the interviews in an MP3 format to the binder. Those tapes that were copies or commercially produced/copyrighted were not digitized., but all other tapes were. There were a total of 92 items. The Nanwalek Audio Tape Collection came about through the diligent work of the English Bay School Students attending classes in 1980 and 1981 and the generosity of Nanwalek Elders, culture bearers, and community members, who shared their knowledge of local history and stories that were passed down to them. By 2012, these cassette tapes the interviews were recorded on were obsolete technologically and, not surprisingly, started to deteriorate. During my stay in Nanwalek as part of the Sugpiaq Ethnohistory Project, I met with Emilie Swenning, as the representative of the local library, to assess the condition of the tapes and find a good archiving approach. While it was clear that we needed to digitize the tapes before they become completely unusable, finding an effective way to do that needed some consideration. The collection consisted of 92 tapes, and each of them had to be manually played while recording into a digital format. This process required a long term commitment and appropriate equipment. For this reason, we signed an agreement that released the tapes into my care so that I was able to transport them to Dartmouth College for digitization. I was able to digitize approximately half of the tapes in Hanover, New Hampshire during the year of 2013. I worked on the other half during the spring of 2014 while living in Homer, Alaska. In the end, 16 tapes were not digitized. Some of these were commercially produced recordings, others were copies of tapes with the copyrights residing at various institutions, and again, others were missing or empty. Of the remaining 76 tapes, some were duplicates, and I selected the better of the two available copies to use while recording. Now that the work is complete, I am returning the tapes back to the care of Emilie Swenning, who is taking them back to the Nanwalek Library, where it will be available for community members. The information recorded on these tapes, the voices of Elders, some of whom had already passed on, and the stories they learned from their ancestors were once close to being lost. Now that they are available in a digital format, they can be shared with all community members, saved on many computers, burned on CDs, played in smart classrooms, and downloaded on digital music players. The more copies there are of these recordings, the more likely they will survive into the future for the education of Sugpiaq generations to come. Sugpiaq Ethnohistory Project Recorded Interviews 2012 – These are included on the Flash Drive with the previous interviews. The information is also in the same binder. 2007 Daily Negotiation of Traditions in a Russian Orthodox Sugpiaq Village in Alaska. Ethnology 46(3): pp. 205-216. 2 copies available. 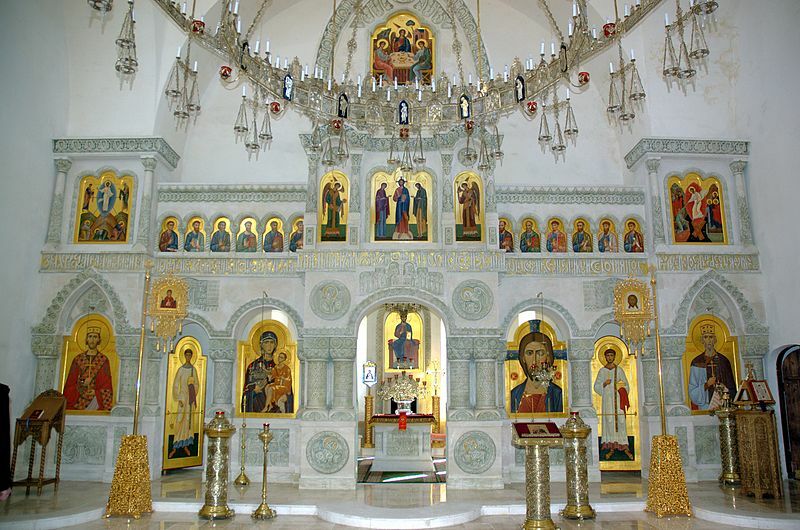 2009 Sugpiaq Russian Orthodoxy – Conceptual Analogy in Religious Syncretism in Nanwalek, Alaska. Unpublished dissertation, University of Alaska Fairbanks. 3 copies available. 2011 Aleut Baseball: Cultural Creation and Innovation through a Sporting Event. Special issue on Creative Technologies. Co-authored with Andreas Droulias, University of Alaska Fairbanks. Études/Inuit/Studies 34(2): pp. 21-37. 2 copies available. 2012 What is in a Name? The Predicament of Ethnonyms in the Sugpiaq-Alutiiq Region of Alaska. Arctic Anthropology 49(1): pp. 3-17. 2 copies available. 2014 Sugpiaq Catalog. Lower Kenai Peninsula Sugpiaq Material Culture and Heritage Preservation Project. A Catalog of Artifacts and Materials From Collections at the Pratt Museum in Homer, Alaska. Pratt Museum. Also available accompanying video recording of Museum-based workshop. 2014 Honda Country – Relocalization through Technology in Nanwalek, Alaska. Unpublished dissertation, University of Alaska Fairbanks. 1 copy available. Today is Palm Sunday according to the Julian calendar (and Easter according to the Gregorian calendar) and many Orthodox Christians, including the community of Nanwalek, prepare for the last week of the Great Lent, Great Week, to celebrate Pascha, Christ’s resurrection on the third day, on Sunday. Easter, and preparation for Pascha, is the most important religious time of the year for Orthodox Christians. Nanwalek also observes this feast with great reverence and appreciation. For this reason, this is a good time to post a segment of the Easter Service I recorded a few years back. This section focuses on the Paschal Troparion – “Christ is risen from the dead, Trampling down death by death, And upon those in the tombs bestowing life.” In Nanwalek, it is sung during the Russian Orthodox Easter Service in three languages: English, Russian/Church Slavonic, and Sugt’stun. The segment captured in this video – also available on the Video Collections page – is from the Paschal Vigil during the procession around the Church. Fr. Sergei Active sung the troparion the first time for that year and it was followed by the Psalms. Below is a description of Easter as part of Nanwalek’s social and religious life. I wrote this section for my dissertation in order to try to capture the meaning of Easter in Sugpiaq Russian Orthodoxy and for the community of Nanwalek. “The preparation and the execution of the rituals, traditions, and customs are all carried out in a social context, complete with the observance and enactment of social hierarchy. Yet, Easter is a deeply spiritual event, a mystical transformation, where God, by the death and resurrection of His Son, grants the possibility of eternal life. It is a shared experience, which cannot escape all who go through Great Lent and the celebration of Easter together. I have never experienced such a complete understanding of communitas as when I was standing in the dark church with the rest of the community at the beginning of Easter service. We were waiting for Father and the rest of the church leaders to assemble the procession, this time not holding the plastenica (the shroud), but rather candles to symbolize Christ’s resurrection. After complete darkness, Father’s candle, the only light in the Church, illuminated the faces of the people we only sensed before. The light was slowly passed down, candle by candle, person to person. The doors of the Church opened, the bell started to ring, and we all joined the procession led by Father and the men honored with carrying icons and devotional items. After the third round of circling the church building along the outside walls with lit candles in hand, we gathered around the stairs to listen to the Easter Evangelium, and to sing the Easter troparion (hymn) for the first time; in English, in Russian, and in Sugtestun. Despite my attention being divided between my video camera and the service, I could feel the joy and reverence emanating from the people around me. It was an end of darkness, and light was to come. The time of sadness was over, and we were all overjoyed. I opened a new area of the website to start listing other resources available on the internet that are relevant to the history of the region. Below are a few highlights. You can find the full list of links on the Resources page. For those of you who are interested in the history of Russian Orthodoxy of Alaska, there is a 10 part audio series available online by Father Michael Oleksa from 1997 on his website. The Thrice-Holy Prayers and Little Litany by Jeff Leer and Sergius Moonin are available on the All Saints of North America Orthodox Church website in a manuscript format from 1981. On the same page, a collection of Kodiak-Alutiiq Orthodox texts are also available from the mid-1800s. There are three interviews available with Dr. Alan Boraas on the history of the Kenai Peninsula through the KBBI radio station’s archives. In 2014, he covered a variety of topics in Dena’ina history as well as early explorers (e.g. Captain Cook), the battle of Kenai, the Alaska Purchase, and salmon canneries, among others. Dr. Boraas has also uploaded his entire, semester-long Cook Inlet Anthropology course as a MOOC (Massive Open Online Course) for anyone who wishes to learn about the this topic. This rich resource includes 22 lectures, a comprehensive bibliography, visual material, and selected readings. The Chenega Diaries project website by the Chenega Village Corporation’s Preservation Program contains videos segments, book excerpts, and educator resources. The Project gathered information and interviewed Elders so their stories can be implemented as curriculum in Chugach region schools. Chenega Diaries: Stories and Voices of Our Past (2011) is only one of many cultural projects by the Chenega Culture Preservation Program. The National Park Service offers two excellent publication that are fully available online. A Stern and Rock-Bound Coast by Linda Cook and Frank Norris is a detailed description of the history of the Kenai Fjords National Park. Chapters 2 and 3 are particularly useful to the Sugpiaq History of the lower-Kenai region. Cultural Science in Kenai Fjords – Connecting with the Past- The Kenai Fjords Oral History and Archaeology Project by Aron Crowell recounts the Aialiq Bay project on the Outer Coast of the Kenai Peninsula. The Alaska Native Language Archives uploaded several resources to their webpage including Nanwalegmiut Paluwigmiut-llu Nupuqnerit and two copies of Nanwalek Highlights. A few years back, we used these student magazines in Nanwalek school to learn about Aleut baseball and the history of Nanwalek in the 70s. Nanwalek Highlights is a precursor to the popular Alexandrovsk series. Finally, UAFs Project Jukebox on Nanwalek and Port Graham has been a tremendous resource for all in the region working with heritage preservation and on cultural projects. The richness of the website reflects the enormous effort Elders, translators, and contributors invested into bringing together multiple voices for sharing Sugpiaq traditions and oral history. If you know of additional digital resources you would like me to list, please leave a comment or email me the link at nanwalekhistory@gmail.com. Thank you! A new section of Nanwalek History – Video Collections nested under Oral History – went up this past week with the help of research assistant Ivana Ash. Ivana summarized two interviews and composed English descriptions for them. In the first interview, Kathy Brewster and Malania Kehl tell the story of Bigfoot. In the second one, Rhoda Moonin talks about life in Nanwalek as she was growing up. Ivana also opened a youtube account for the website and uploaded these two video segments. For those of you in Nanwalek and other communities with streaming limitations, Rhoda’s interview is 1.53 GB while Kathy’s and Malania’s is 1.24 GB. You can stream both straight from the website. Moreover, Ivana sorted through the photos from my fieldwork at the British Museum and organized them into files labeled with appropriate accession numbers. I will start uploading the photos this week. As I will be uploading material to the website throughout the winter break, I will not post each addition on Facebook. This would overwhelm the discussion in the Sugpiat group. Instead, if you would like to receive notification when each upload becomes available, you are welcome to sign up with your email to receive notifications. You can do it right here on the sidebar by entering your email address and hitting the “Follow” button. 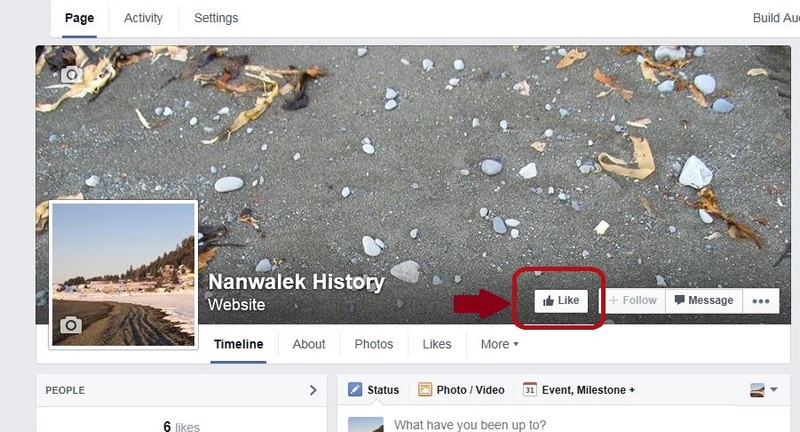 Alternately, or in addition to, the previous, you can also go to the Nanwalek History Facebook page and “like” the page. I will keep posting updates on the Nanwalek History Facebook page so you will receive notifications when something new goes up on the website. To reach the new content, you can either click on Oral History and then follow the corresponding links to each video or go directly to Video Collections. This post is to share the good news that the Sugt’stun App – Android Apps for the Preservation of Endangered Languages project has been generously funded by the University of Alaska Anchorage’s (UAA’s) Faculty Development Grant. This is a collaborative project between the Nanwalek IRA Council, Dr. Kirk Scott and his Engineering Research Assistants, and me and my Anthropology/Alaska Native Studies Research Assistant, Ivana Ash. This will allow us to further develop our pilot-app with additional vocabulary and functions as well as to experiment with future directions. It will also allow us to invite you all to test out the app during your visits to Anchorage and give us feedback on the new directions we are going to take. Moreover, Ivana, as Research Assistant, gave the first public presentation on this project at UAA’s Alaska Native Studies Undergraduate Symposium. She gave an excellent explanation of the concepts we are using to build this App and the challenges we are facing in this work, using the differences between Unani, Kananii, and Camani (meaning “down there” in different variations). 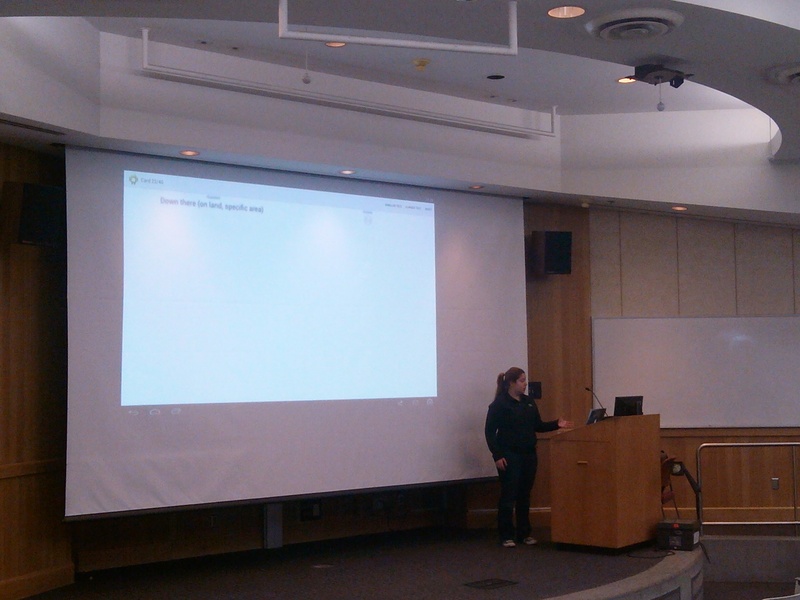 Ivana presenting on the Sugt’stun App project. There is still a lot of work to do, but this is as an exciting opportunity we can build on and expand so that we can eventually create a fully functional app with guidance from Elders and fluent speakers. This is also a great time to stop and thank all past, current, and future collaborators for their input and support – Quyanaa! 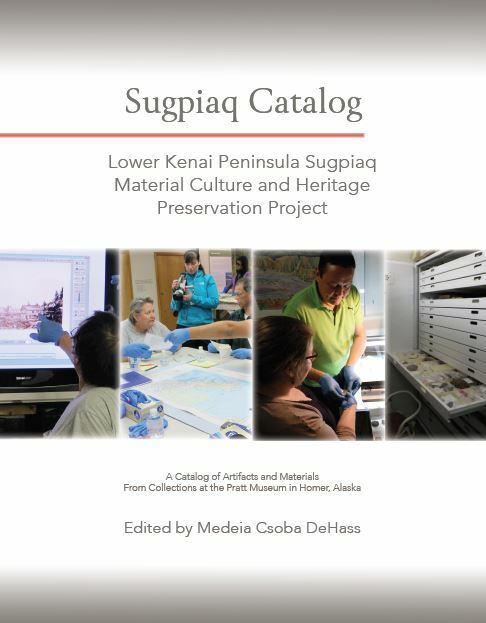 Here is the final product of the Lower Kenai Peninsula Material Culture and Heritage Preservation Project – the Sugpiaq Catalog. It can be downloaded in a pdf version by clicking on the title below. You will need to have Adobe Acrobat installed on your computer in order to open it. The free Adobe Reader can be downloaded by clicking here. Thank you all for your contributions and please feel free to leave a comment here or on Facebook.